于悦, 郭新慧, 严寒秋, 高志勇, 李伟红, 刘白薇, 王全意. Yu Yue, Guo Xinhui, Yan Hanqiu, Gao Zhiyong, Li Weihong, Liu Baiwei, Wang Quanyi. Yu Yue, Guo Xinhui, Yan Hanqiu, Gao Zhiyong, Li Weihong, Liu Baiwei, Wang Quanyi. Systematic review on the characteristics of acute gastroenteritis outbreaks caused by sapovirus[J]. Chinese Journal of Epidemiology, 2019, 40(1): 93-98. Abstract: Objective To understand the epidemiological and etiological characteristics of outbreaks on acute gastroenteritis caused by sapovirus (SaV) worldwide. 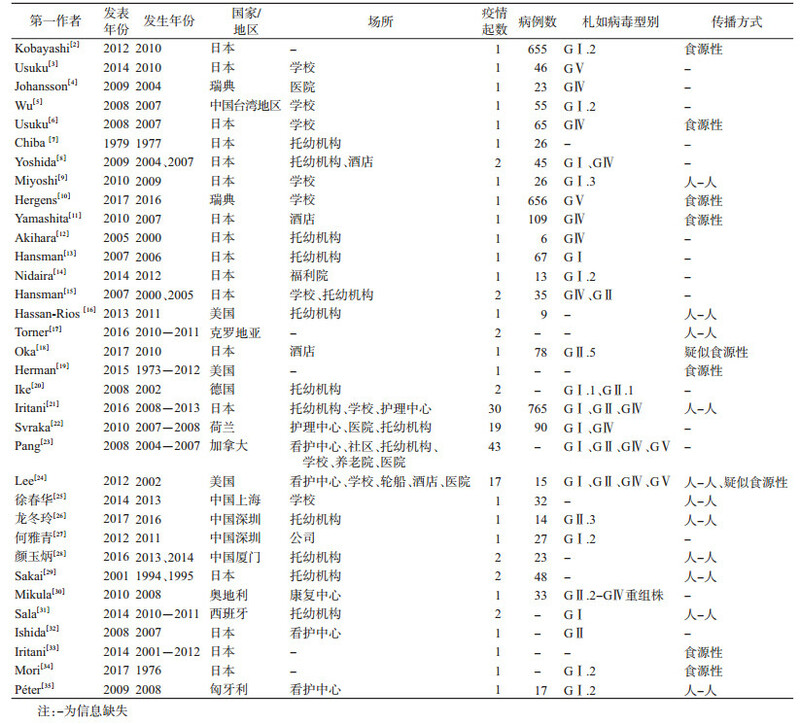 Methods Literature about the outbreaks on acute gastroenteritis caused by SaV were retrieved from the databases including WanFang, CNKI, PubMed and Web of Science after evaluation. Time, geography, setting and population distributions of outbreaks, transmission mode, SaV genotype and clinical characteristics of the patients were analyzed. Results A total of 34 papers about SaV were included, involving 146 outbreaks occurred between October 1976 and April 2016. In these papers, 138 outbreaks were reported on the related months. All these outbreaks occurred in northern hemisphere. SaV outbreaks occurred all year around, but mainly in cold season, the incidence was highest in December (25 outbreaks) and lowest in in August (2 outbreaks). Most outbreaks were reported by Japan, followed by Canada, the United States of America and the Netherlands. There were 141 outbreaks for which the occurring settings were reported, child-care settings were most commonly reported setting (48/141, 34.04%), followed by long-term care facility (41/141, 29.08%) and hospital (16/141, 11.35%). Clinical symptoms of 1 704 cases in 31 outbreaks were reported, with the most common symptom was diarrhea (1 331/1 704, 78.12%), followed by nausea (829/1 198, 69.20%), abdominal pain (840/1 328, 63.25%), vomiting (824/1 704, 48.36%) and fever (529/1 531, 34.53%). Genotypes of SaV were determined for 119 outbreaks. GⅠ(51/119, 42.86%) and GⅣ (45/119, 37.82%) were predominant. The outbreaks of GⅣSaV increased suddenly in 2007, and the outbreaks of GⅠSaV mainly occurred in 2008 and during 2011-2013. Conclusions SaV outbreaks were reported mainly by developed countries, with most outbreaks occurred in cold season, in child-care settings and long term care facility. GⅠand GⅣ were the most common genotypes of SaV. Prevention and control of SaV outbreak in China seemed relatively weak, and it is necessary to conduct related training and to strengthen the SaV outbreak surveillance in areas where service is in need. 徐春华, 王志, 王健. 一起小学札如病毒急性胃肠炎聚集性疫情调查[J]. 中国消毒学杂志, 2014, 31(5): 490-492. Xu CH, Wang Z, Wang J. Investigation on the cause of clustering outbreak of acute sapovirus gastroenteritis epidemic in primary students[J]. Chin J Disinfect, 2014, 31(5): 490-492. 龙冬玲, 庄辉元, 靳淼, 等. 一起由札如病毒引起的急性胃肠炎暴发疫情的分子流行病学研究[J]. 国际病毒学杂志, 2017, 24(3): 183-186. 何雅青, 卓菲, 张海龙, 等. 一起札如病毒所致成年人急性胃肠炎暴发的分子流行病学研究[J]. 疾病监测, 2012, 27(2): 101-103. 颜玉炳, 苏成豪. 札如病毒致幼托儿童急性胃肠炎爆发疫情特征分析[J]. 中国校医, 2016, 30(5): 364-366. Yan YB, Su CH. Analysis of epidemiological characteristics of acute gastroenteritis outbreaks caused by sapovirus in preschool children[J]. Chin J School Doctor, 2016, 30(5): 364-366. Ishida S, Yoshizumi S, Miyoshi M, et al. Characterization of sapoviruses detected in Hokkaido, Japan[J]. Jpn J Infect Dis, 2008, 61(6): 504-506. 周锦辉, 严寒秋, 高志勇. 人类札如病毒流行概况[J]. 国际病毒学杂志, 2017, 24(2): 133-136.